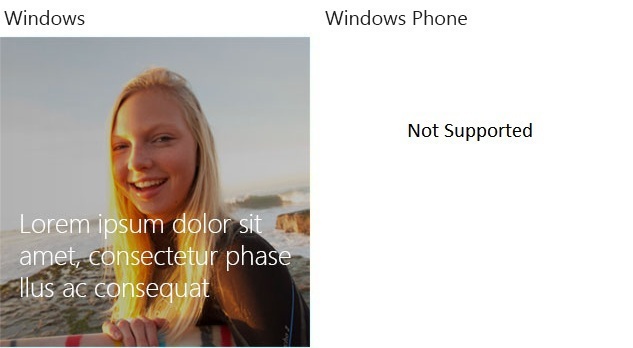 This topic lists the tile templates available for use in a tile notification, with pictorial examples of each for both Windows and Windows Phone 8.1. Select a template name from the list to be shown its details, such as sample XML content, versioned names, and image sizes. 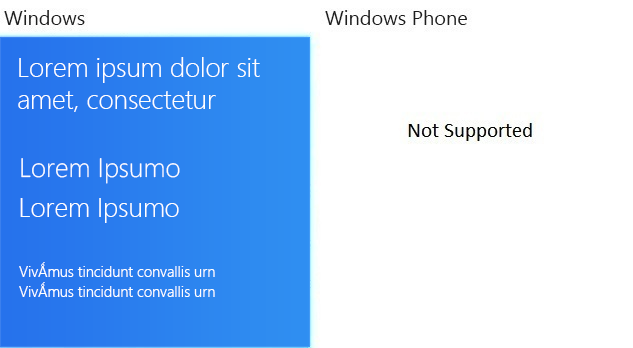 Note When displayed on Windows Phone 8.1, certain template types do not act as they do when displayed on Windows. Peek templates on the phone flip from front to back rather than scrolling up and down and image collection tiles have an animated checkerboard pattern. Medium tiles are square and contain either only an image or only text. 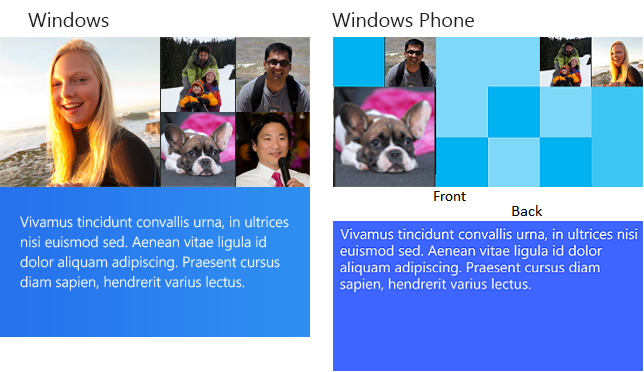 Medium peek tiles enable you to combine images and text in an animated tile. 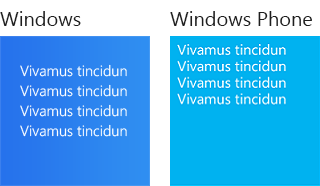 Windows: One string of large block text (generally numerical) over a single, short line of regular text. Windows Phone 8.1: One short string of large block text (generally numerical) in the lower right corner, to the left of a single, very short line of regular text. Note Peek templates on the phone flip between the two sections rather than scrolling up and down between them. 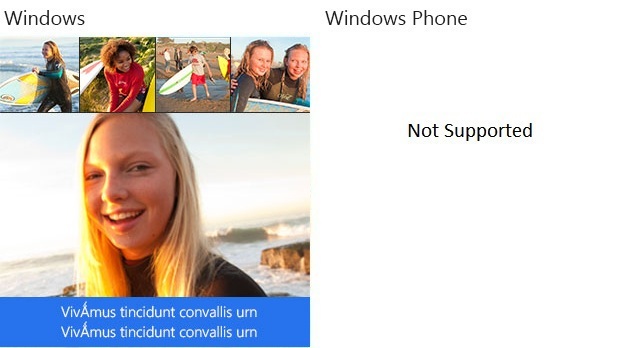 Important If this template is sent to Windows Phone 8.1, it causes the tile to revert to its default image. One header string in larger text over eight short strings of regular text arranged in two columns of four lines each. The column widths are such that the first column acts as a label and the second column as the content. This template is similar to TileWideText10, but the first column is wider. Ten short strings of regular text arranged in two columns of five lines each. The column widths are such that the first column acts as a label and the second column as the content. This template is similar to TileWideText11, but the first column is wider. One header string in larger text over eight short strings of regular text arranged in two columns of four lines each. The column widths are such that the first column acts as a label and the second column as the content. This template is similar to TileWideText07, but the first column is narrower. Ten short strings of regular text arranged in two columns of five lines each. The column widths are such that the first column acts as a label and the second column as the content. This template is similar to TileWideText08, but the first column is narrower. 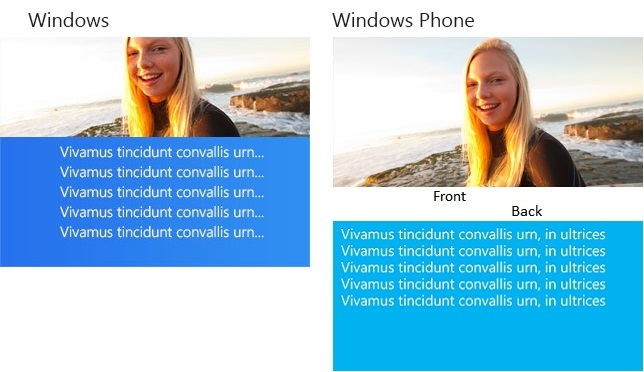 Important The last of the four strings on the left is ignored in Windows Phone 8.1. 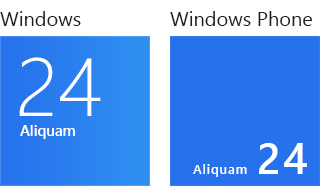 Windows: One large square image with four smaller square images to its right, no text. 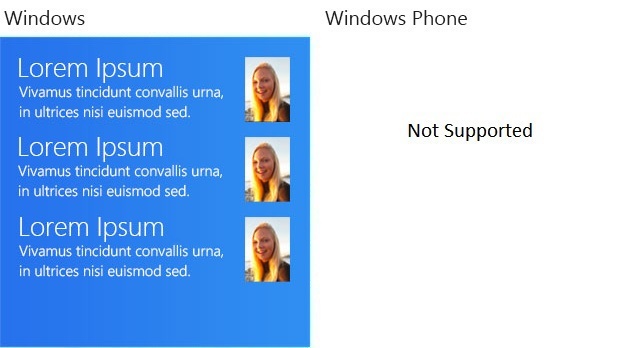 Windows Phone 8.1: The images appear in a 6x3 set of tessellated, flipping blocks. An image might take up one block or four. Images are shown randomly, moving among blocks of various solid colors. One wide image over one string of regular text wrapped over a maximum of two lines (one line on Windows Phone). The width of the text area depends on whether a logo is displayed. Note This template allows branding only as "logo" or "none", but not "name". If you set the branding attribute to "name", it will automatically revert to "logo" on Windows or "none" on Windows Phone 8.1. 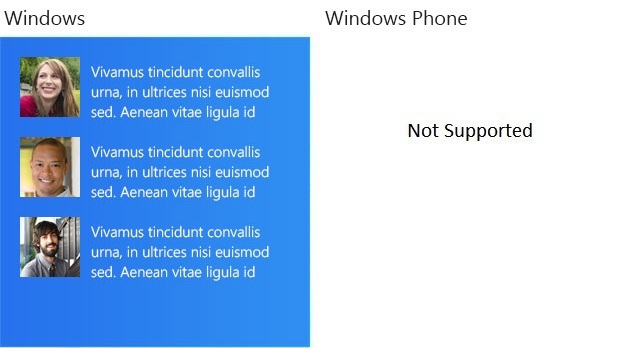 Windows: One wide image over two strings of regular text on two lines. Text does not wrap. The width of the text area depends on whether a logo is displayed. 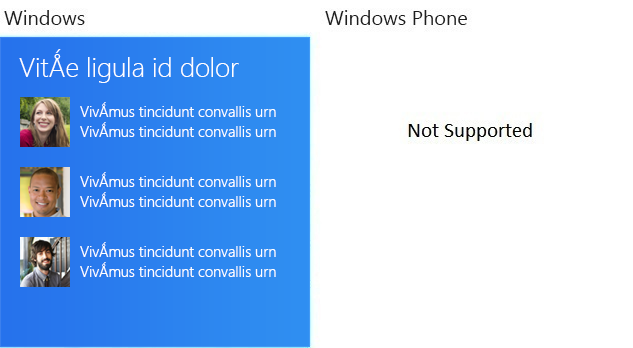 Windows Phone 8.1: One wide image over one string of regular text on one line. Text does not wrap. The second string is ignored. The width of the text area depends on whether a logo is displayed. 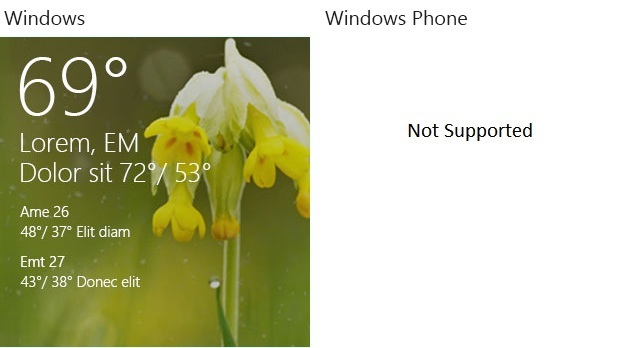 Important On Windows Phone 8.1, the image is not shown. On the left, one small image; on the right, one header string in larger text on the first line over four strings of regular text on the next four lines. Text does not wrap. 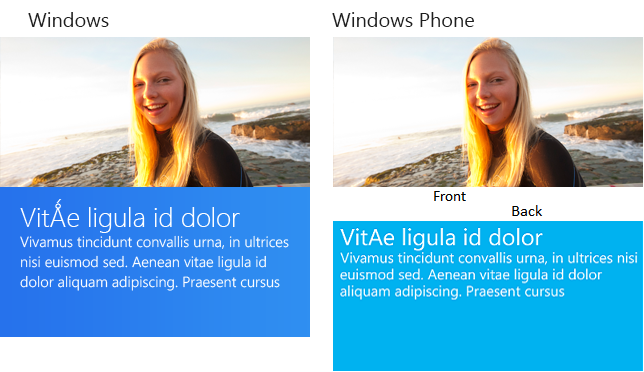 On the left, one header string in larger text over one string of regular text wrapped over a maximum of four lines; on the right, one small rectangular (3x4) image. Images wider than the image area will be cropped. Note Peek templates on the phone flip between the two section rather than scrolling up and down between them. 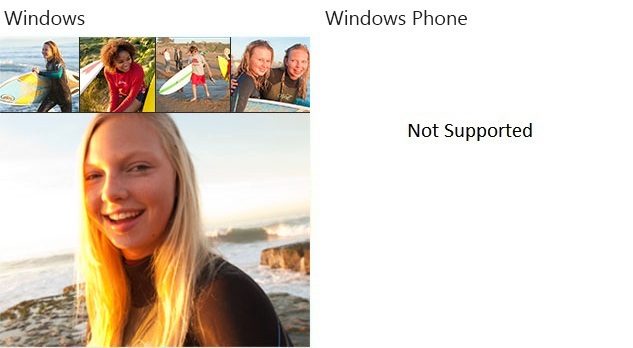 Windows: Top: One large square image with four smaller square images to its right, no text. Note that the large image is not quite square; it is slightly wider than it is tall. If you supply a square image, the image will be scaled for width and slightly cropped on the top and bottom. Windows Phone 8.1: Front: The images appear in a 6x3 set of tessellated, flipping blocks. An image might take up one block or four. Images are shown randomly, moving among blocks of various solid colors. Top: One large square image with four smaller square images to its right, no text. Bottom: On the left, one small image; on the right, one string of large text wrapped over a maximum of three lines. 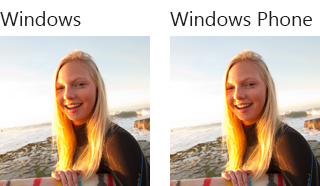 Windows: Top: One wide image, with a shorter height than a full-bleed wide image. Windows Phone 8.1: Front: One wide image that fills the entire tile. Note This template allows branding only as "logo" or "none", but not "name". If you set the branding attribute to "name", it will automatically revert to "logo". Windows: Bottom: On the left, one small image; on the right, one header string of larger text on the first line over one string of regular text wrapped over a maximum of four lines. Windows Phone 8.1: Back: One header string of larger text on the first line over one string of regular text wrapped over a maximum of four lines. 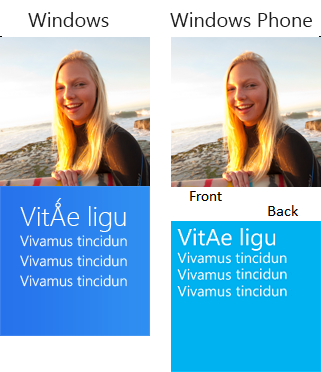 Windows: Bottom: On the left, one small image; on the right, one string of large text wrapped over a maximum of three lines. 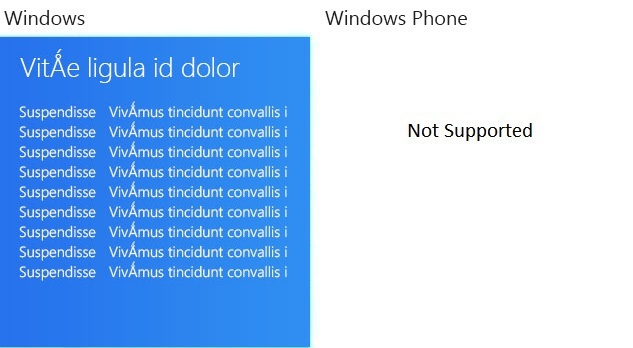 Windows Phone 8.1: Back: One string of large text wrapped over a maximum of three lines. 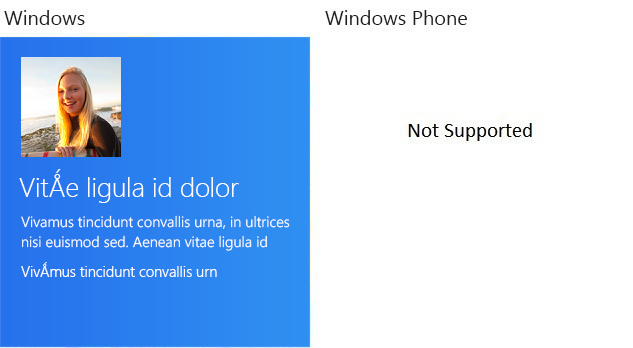 Important On Windows Phone 8.1, the small image that accompanies the text is not shown. Note This template requires the visual element to declare version="2". One header string in larger text over eighteen short strings arranged in two columns of nine lines each. Columns are of equal width. This template is similar to TileSquare310x310Text05 and TileSquare310x310Text07, but those templates use columns of unequal width. Twenty-two short strings of regular text, arranged in two columns of eleven lines each. Columns are of equal width. This template is similar to TileSquare310x310Text06 and TileSquare310x310Text08, but those templates use columns of unequal width. The leftmost pixel of image 2 and the rightmost pixel of images 4 and 5 are obscured by a border. One image above one string of regular text wrapped over a maximum of two lines. The width of the text area depends on whether a logo is displayed. One image above two strings of regular text on two lines. Text does not wrap. The width of the text area depends on whether a logo is displayed. TileSquare310x310ImageCollection with the addition of a text ribbon across the bottom of the tile. The text area contains one string of regular text wrapped over a maximum of two lines. Note that the small images cut off the top of the large image while the text area cuts off the bottom of the image. The width of the text area depends on whether a logo is displayed. TileSquare310x310ImageCollection with the addition of a text ribbon across the bottom of the tile. The text area contains two strings of regular text on two lines. Text does not wrap. Note that the small images cut off the top of the large image while the text area cuts off the bottom of the image. The width of the text area depends on whether a logo is displayed. Note This template requires the visual element to declare version="3". Some values are rounded up to the nearest pixel, but rounding down is equally valid. A single icon image. The icon image's background should be transparent to allow the tile color to show through. A badge is shown to the right of the image, and the image should be sized to allow that badge to have enough room. Unlike other example images on this page, the badge (in this case, the number 36) is included here. This template, being the small tile size, cannot display the app name or logo declared in your manifest. Important The tile content and the badge are sent through separate notifications. Think of the badge more as an overlay than as part of the tile's XML content. A single icon image. The icon image's background should be transparent to allow the tile color to show through. A badge is shown to the right of the image, and the image should be sized to allow that badge to have enough room. Unlike other example images on this page, the badge (in this case, the number 36) is included here. In the lower right corner, a single icon image. The icon image's background should be transparent to allow the tile color to show through. A badge is shown to the right of the image. Unlike other example images on this page, the badge (in this case, the number 36) is included here. 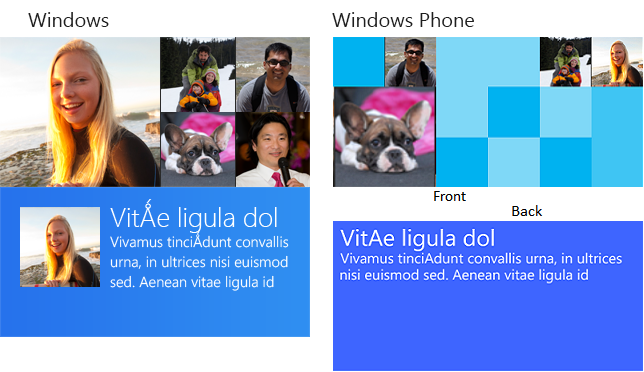 Note If no text elements are specified in this template, the icon image and badge are centered in the tile. Windows 8.1 added new templates for large, square tiles. To distinguish large tiles from medium tiles (known as square tiles in Windows 8), all of the older templates were renamed, leading to the use of versioned templates. Version 1 notifications are declared by setting the version attribute of the XML payload's visual element to "1" or omitting the attribute altogether. Version 1 notifications meet the Windows 8 definition—original template names and schema elements. Version 1 notifications do not recognize any later template names, which includes all of the large and phone-only templates. When Windows 8.1 or Windows Phone 8.1 receives a notification that contains a version 1 payload, it recognizes the older template name, substitutes the newer name in its place, and processes the notification normally. 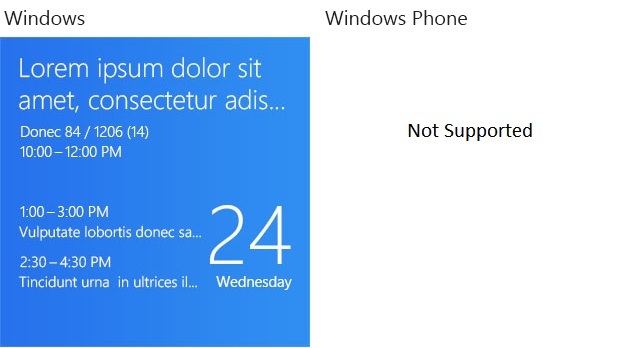 However, because a version 1 notification cannot include a binding for a large tile, if the user has sized the app's tile to large, the notification cannot be displayed. Version 2 notifications are declared by setting the version attribute of the visual to "2". Version 2 notifications recognize the large templates, the new template names, and the fallback attribute of the binding element. In a version 2 notification payload, the old template names are only recognized in the fallback attribute. The template attribute must be set to one of the new template names. Version 3 notifications differ little from version 2 notifications, except that they recognize the phone-only templates. 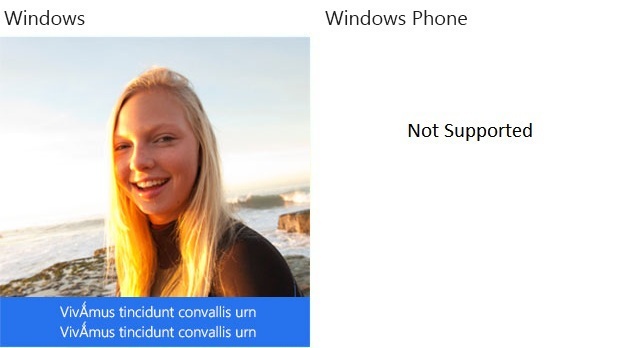 You can use the version and fallback attributes to send a notification that can be recognized whether it's received by a Windows 8 client or a Windows 8.1 or Windows Phone 8.1 client. When a Windows 8 device receives a version 2 or 3 visual element, it will not recognize the template value because it only recognizes the older template names. When Windows sees version="2" or version="3" in the payload, it knows to look for the fallback attribute for a recognized value. If the fallback attribute for the binding that matches the tile's current size is missing or contains an unrecognized template name, the notification is not shown; otherwise, the template name specified in the fallback attribute is used and the notification is processed normally. 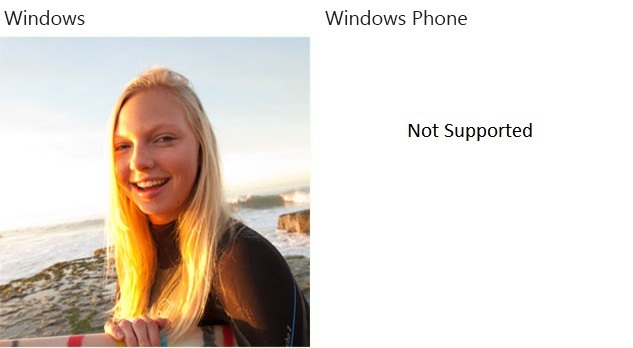 The phone-only and large templates do not have a fallback value. Exact sizes are given for each image in each template for each supported scale. You are not required to provide images that specifically match those sizes, but images that do not are scaled and cropped as necessary. For more information, see Tile and toast image sizes. However, because of time or resources, you might not want or need to supply a full set of assets. In that case, you're going to be inclined to supply the 100% image, since that size is right in the template name, but that would not be ideal. We recommend including the following assets for optimum results. If you only supply a single asset, it should be the larger of the two. Important Images are sized and cropped differently on Windows and Windows Phone 8.1, so the same image in the same template might appear differently on the different devices if sizing or cropping is required. Note that when they are displayed on a device set to a right-to-left (RTL) language, templates are generally flipped right-to-left as well. On Windows, some templates do not display the last line of text if the tile is showing a small logo image or display name, neither of which are shown in the illustrations on this page. For more information on the small logo and display name tile settings, see Quickstart: Creating a default tile using the Microsoft Visual Studio manifest editor. 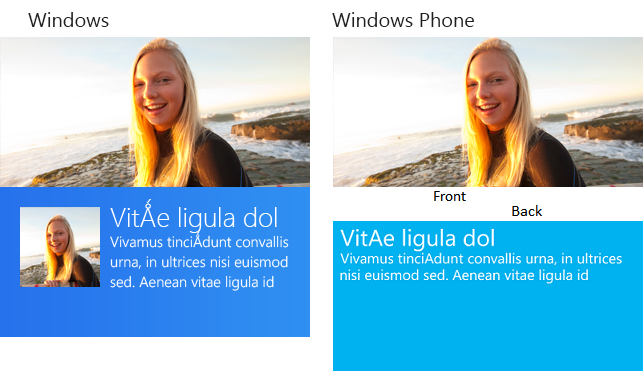 Note Windows Phone does not support the small logo on tiles. It shows the display name by default, but this can be turned off so that nothing is shown in that area.